Winter sometimes can be an interesting time to find subject matter. Either really good snow opportunities or lots and lots of dreary gray days. This winter here in Indiana has been a little challenging for shooting. We've had snow, but it hasn't timed out real well with the daylight clock. After we've had it, it has gotten bitterly and dangerously cold. While this has kept me from shooting much, it has provided a rare opportunity that is always exciting. Frozen waterfalls. Down in Madison, Indiana is a little gem of a state park. Clifty Falls. Clifty is an unusual feature for the state - a deep canyon lined with multiple waterfalls. The canyon runs roughly a mile and a half from where Big and Little Clifty creeks drop into the canyon to merge and runs to where Big Clifty creek empties into the Ohio River. Over this range the Creek loses 400 feet of altitude. The canyon is 300 feet deep in most places and a couple hundred feet wide. There are 4 waterfalls each with drops of 65 to 80 feet. The falls here don't drain large amounts of water, during the summer two of the falls from smaller tributaries are prone to running dry. The canyon is forested, obstructing views to a degree. The best views come from wading the creek from the southern end of the park. During extreme cold like what we've had this year, the falls begin to ice up creating either ice shafts that drop to the bottom of the canyon or massive icicles 40 feet or more in length. Seepage points all along the shale canyon grow stalactites of ice. 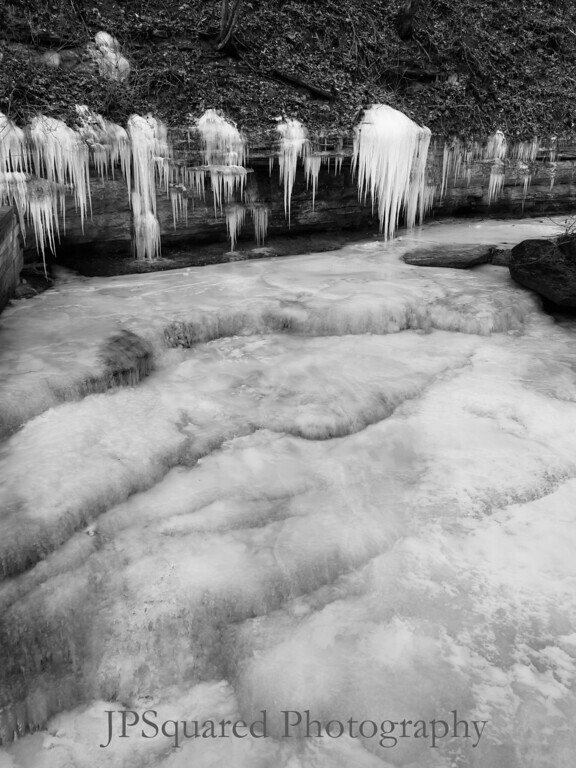 The creeks at the top of the waterfalls freeze up into rippled terraces of ice. The spectacle is a great outdoor shoot. The trick how ever is to choose a day that is warm enough to be managably comfortable but not warm enough that the icicles come apart and drop into the canyon below. I have shot the frozen canyon twice, back in 2013 and again this year. This year I shot from the rim, but in 2013 I hiked down to the floor below and went up stream. In 2013 as well, the rim paths were a little different than this year. Since then a number of rock falls have changed the routes for the hiking paths. Unfortunately it is far more difficult to get to the "cave" underneath little Clifty falls than it used to be. When I shot in 2013, I got home and was frustrated with my inability to process my shots into anything that I thought did the frozen spectacle justice, so most those images sat on my hard drive undisturbed. After working with this year's shots, I decided to go back and look at the 2013 images. I pleasantly discovered that my Lightroom skills have come along enough that I was able to do at least a little bit of justice to the frames I shot. Images from both years are in the slideshow below. I hope you enjoy!